L: 78" x W: 44" x H: 30.5"
Soleste Dining Table w/ Leaves If your home is a frequent gathering spot for family and friends, you’ll love the beauty and convenience of this Soleste dining table with leaves. Its eye-catching design puts a sophisticated spin on casual style with a honey finish and a gorgeous walnut inlay in the tabletop. Plus, you’ll love the fuss-free distressing, which adds a hint of rustic charm. If your home is a frequent gathering spot for family and friends, you’ll love the beauty and convenience of this Soleste dining table with leaves. Its eye-catching design puts a sophisticated spin on casual style with a honey finish and a gorgeous walnut inlay in the tabletop. Plus, you’ll love the fuss-free distressing, which adds a hint of rustic charm. Sturdy, attractive, extends out to seat 8 comfortably. Looking forward to many family dinners. This table is just beautiful. It's built very sturdy and the legs are for supportive. Just a wonderful addition to our dining room. It is beautiful, sturdy and will last forever! This is the most beautiful table I have ever seen! The inlaid wood design is gorgeous and unique. It’s well made and solid. I’m thrilled with it. We purchased just the table as it matched perfectly with our 6 chairs. Love the style with the pedestal/trestle. The detail in the center of the table is beautiful! This table is very very sturdy and looks amazing in our dining room. You won't be sorry with this purchase. This table was originally our 2nd choice. Wish we had picked it first! 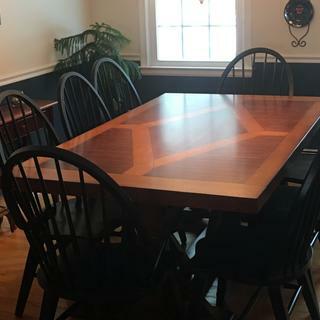 We had originally purchased the Colebrook Dining Table and had problems with the slides trying to put in the 18" leaves and traded for the Soleste Dining Table. So glad we did! And a hugh shoutout to the Service Dept, delivery guys and repairman. All very pleasant and nice to work with. We purchased this large table for our first home so we can host all the family gatherings now. It is made for eight people but we can easily fit ten people in. The wood pattern is a unique and fun design that will go with so many different styles. We love it! Beautiful piece for casual dining room. We purchased this table to coordinate with several other pieces in varying wood finishes. The distressing also made it a perfect match with the painted black chairs. This table really is the perfect piece for our informal dining room which we use everyday! This dining room set it the most beautiful, sturdy, large table for gathering all out kids and grandbabies, love it! This is just a very beautiful table. Very solid, sturdy and looks great in a dining room. No problem to sit 6 people, even when not using the leaves. I’m getting lots of compliments on this table the colors and design is outstanding. This table is so beautiful in person and very solid. I love it so much! It is a very nice table. I recommend this product. I love it. It is the most beautiful table. It is sturdy and just so pretty. Everyone says wow wow wow. The table has exceeded my expectations. Because of the two tone wood I was afraid it would not match my existing chairs but it did and looks great. Leaves are easy to install and look seamless with the design. Lots of legroom because of the trestle feature. This is a great high-quality table that was exactly the casual style I was looking for. Wonderful wood colors and design on top with sturdy legs and double leafs that allow flexible seating. Searched all over but only Raymour & Flanagan had this great piece of furniture! Exactly as advertised! Beautiful, solid table. Perfect for my space. Delivered promptly and assembled quickly. Love it! Our home dining room has a honey knotty pine paneling and this table and chair set fits perfectly in the color scheme. We walked into the store, seen it, and knew it was a perfect match. With leaves it is bit to long, but for those rare occasions when hosting a dinner party we will make do. Right now my wife loves this set so much, she is treating more like an art piece than functional furniture. I like it because it is sturdy and wide. We love our new Soleste dining table (note - we did the Barrington chairs instead of the Soleste chairs and very happy with them too - looks great with the table) and like how thick and sturdy it is. The design is attractive and makes it stand out from just a regular wood dining table. This is a sturdy, well built table. Purchased the 7 piece set, and ordered the wine server. Goes well with my home decor, including my bamboo wood flooring. We just bought this beautiful table. It is so solid, it is made to last a life time. This is an incredible looking table that is well made. The inlaid wood grains on the top are beautiful. The way the leaves fit into the sides is different than most tables. It also has clips underneath the table to keep the ends tight against the main part of the table. There are also clips on the leaves to fasten them in with. The table is perfect for a party of 4 without the leaves. Then you can add one leaf and it works for 5, Add the other leaf and now it works for 6. With both leaves it would fit 8 people easily. Its a heavy table that takes some effort to more it. Perfect for what we wanted. This table exceeded my expectations! We love it and are excited to put the TWO leaves in it to extend to host family parties! The chairs are amazingly comfortable, too! So many compliments on this table. We just got it two weeks ago and already had 3 dinner parties! It is just beautiful and sturdy! I purchased this table because it has two leaves. It measures at 78 , 90 and 102 with all leaves. As my family grows its very comfortable. Study , but beautiful looking. Everyone sits arund and they have space. I never write a review, but I just had to today. I've been looking for the perfect table for my kitchen. My search was turning up nothing and I was ready to just have an island installed instead. That is until I came across the Soleste set. I fell in love with it online, but had to go into the store to see it in person before making a final decision. I actually sat on making this purchase since last October. I finally pulled the trigger Sunday 2/28/16 and man oh man I am IN LOVE. This set is everything I needed and more. The construction is great and it really fits in with my decor. I will never shop anywhere else for furniture for a while. This is my 3rd Raymour purchase and I will be back. *this is not a paid review. If I could, I'd post a picture of my set in the space. This is a beautiful table - sturdy, and very well-built. Delivery was flawless, and we had the table on the exact date we requested. Couldn't have done better! Solidly built, sturdy chairs are sooooo comfortable, love the set it looks great in our home. Quality product from a trusted furniture store who stands behind their products. Great service and support form Raymour & Flanigan. Super fast shipping and most important the delivery men were professional and cautious, they took special attention delivering on a snowy day to lay cardboard on our floor to not dirty our floors. The whole experience was pleasant and I was impressed. We absolutely love this table. The quality and craftsmanship for the price is excellent. Set up and delivery were on time and efficient. Highly recommend it. My table got scratched very easy. We put dishes on the table and had dinner and when we cleared the table it was covered in scratches. Has anyone else had a issue with this table? BEST ANSWER: This issue would need to be discussed with our customer care center. Please call 866-383-4484 option 2 to discuss this issue further. how do i store the leave inside the table? Is there a matching bench available for this table? BEST ANSWER: No, I'm sorry. There is not a matching bench for the Soleste table. Did the table legs every get in the way when seated? BEST ANSWER: The table legs do not get in the way of seating. BEST ANSWER: The dimension between the legs of the Soleste Dining Table is 45". How wide are these chairs ? BEST ANSWER: The Soleste Microfiber Dining Chair is 22" from left to right when standing in front of and facing the chair. The total dimension from back to front is 26" and the seating area from back to front is 18.5". Can this table be ordered in 36" height ? BEST ANSWER: I'm sorry. The Soleste Dining table is available only as shown. does this table come in a smaller version ? BEST ANSWER: Hello John, the Soleste Dining Table is only offered in the dimensions as shown. Can the legs be removed from table? BEST ANSWER: The entire table top will come off. The base is attached. No separate legs. Beautiful table!! BEST ANSWER: The Soleste collection does not include armchairs. SHOULD WAX BE APPLIED TO TABLE ? BEST ANSWER: Wax would not be required. will this get water marks on it? BEST ANSWER: As the table top is not water resistant we recommend using care in protecting the table from extreme water and heat. We also recommend our Platinum Protection plan to cover your furniture from accidental damage. Can this table seat 12? BEST ANSWER: This table can comfortably seat up to 10. 12 would be very tight. Do you sell a pad to be placed on this table during serving for protection? BEST ANSWER: Raymour & Flanigan does have table pads which are available to special order exclusively through your local Raymour & Flanigan store. is there a full hutch for this set? BEST ANSWER: While there is not a full hutch included in the Soleste collection, there is a Server w/ Wine Storage, SKU 750012886 which may be considered. who is the manufacturer of this table and can it be delivered to Las Vegas, NV? BEST ANSWER: The Soleste collection is manufactured by Bellanest which is Raymour & Flanigan's exclusive brand. We may be able to deliver to you. Please contact the online sales department at 866-383-4484 option 3 with your zip code and the name or SKU number's of the merchandise you are interested in. We would then need to get in touch with our out of market delivery department to see if we can make this delivery and what the costs would be.